Just in time for what is bound to be a crazy holiday season, the Casa Soria dining room has undergone a massive spruce up (circle back to the intro post to see all the “before” shots and read more on the what’s and why’s). 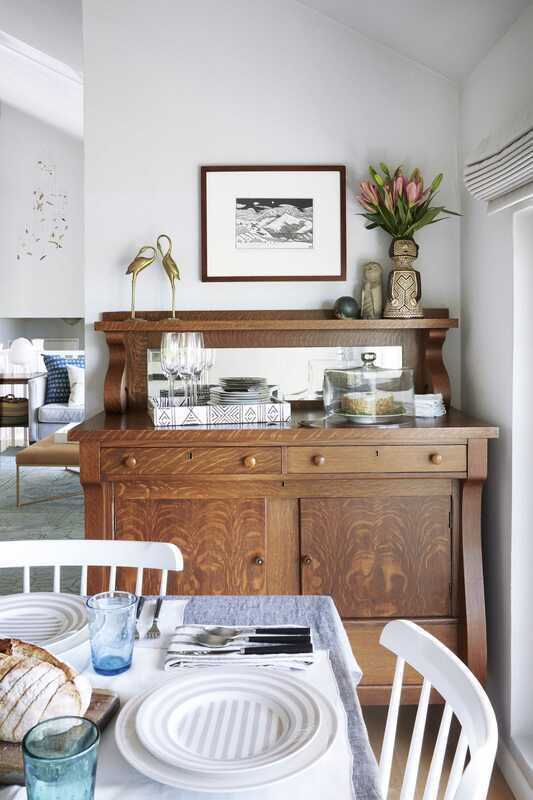 What started as a request from orMOMdo for a new dining table evolved into a re-organization of the space and a case study in how to incorporate family heirlooms, mismatched in both style and scale, into a space. I know that this is an issue a lot of people face (not everyone can just get rid of everything they own and start fresh like we do here inside the Internet!) so I relished the challenge to figure out how to make this space stylish and functional while not losing pieces my parents cared about. My parents brought almost everything from the Yosemite house I grew up in to Casa Soria when they moved here five years ago. Most of it found a natural home, but many pieces didn’t integrate as well as they did into our old house. The Yosemite house was small (I think around 1,500 square feet), kind of a craftsman-style bungalow that looked like a cabin. I used to get super pissed when tourists would pass by and be like “HOW MUCH IS TO RENT THAT CABIN?” I’d be like “THIS IS MY HOUSE, DUDE.” I guess it’s fine to call your own house a cabin but if someone else calls it a cabin, it feels like an insult. Be forewarned if you happen upon any forest people, not all of us like you to call our houses “cabins.” Casa Soria is bigger (I think around 2,800 square feet) and the style is totally different, so its furnishing needs are also different. I’ve always liked this curio cabinet my parents bought in the nineties. It’s kind of a nineties take on craftsmen and the A-line makes it feel a little lighter. My mom has a lot of pretty objects, mostly Japanese Kokeshi dolls and basketry/art by the Miwok and other Native American tribes local to the Sierra Nevadas. 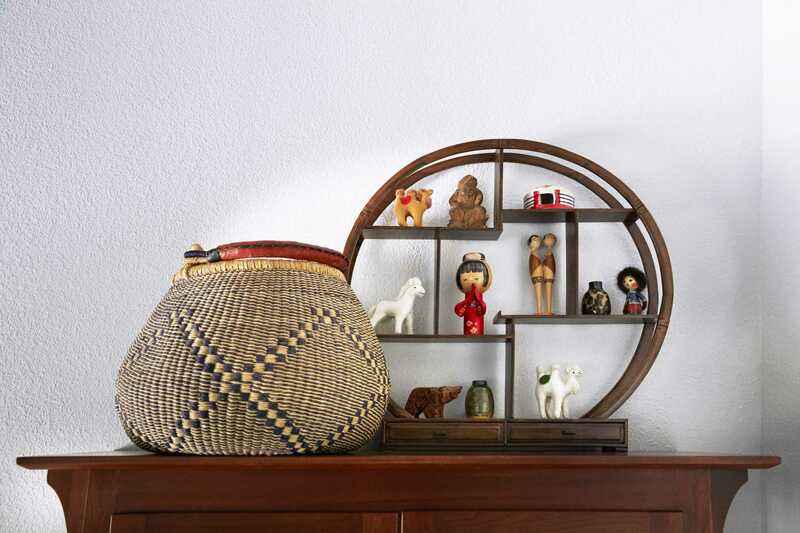 This basket might look like it’s just a pretty accent, a way to ground that mini display shelf to the top of the cabinet, but it actually serves a TOP SECRET DUAL PURPOSE. Somehow, in our massive kitchen renovation (details coming soon GET EXCITED) we weren’t able to find a spot for a laundry hamper. So this is where orMOMdo throws dishtowels and cleaning rags after she uses them (we put a little plastic liner inside to prevent it from ruining the basket). The new dining table from Rejuvenation has been a huge game changer. It’s the max length for the space, meaning it can seat a lot of people. Unextended, it can seat eight comfortably, but we’ve seated ten there, two on each end, for the fancy birthday dinner my sibling and I threw for orMOMdo and it was perfect. I chose this table because it has a pretty simple design that is traditional enough to satisfy my orlanDAD’s taste but also contemporary enough to feel at home in the house. Another great update was the addition of a simple, soft Roman shade from The Shade Store. We chose a very pretty sheer wool color called “Cloud” that blends nicely with the wall color (Alaskan Husky by Benjamin Moore). As you probably remember, my parents really fought me on these. They didn’t see the point of adding window treatments in their front rooms because they’re never in there at night and weren’t worried about privacy (hello, what about keeping heat in during the winter and out during the summer?!?). But now that they have them they actually use them, like, daily. And the softness they add to the space makes everything feel cozier. So quite honestly, I’m glad I manipulated my parents into allowing me to get them glamorous window coverings THAT THEY ACTUALLY USE EVERY DAY. I’m honestly really impressed with the huge Orb-Lando orMOMdo made when they moved in. It’s three feet wide and SO much cuter than the fixture that was there before (see how ugly it was in the intro post). 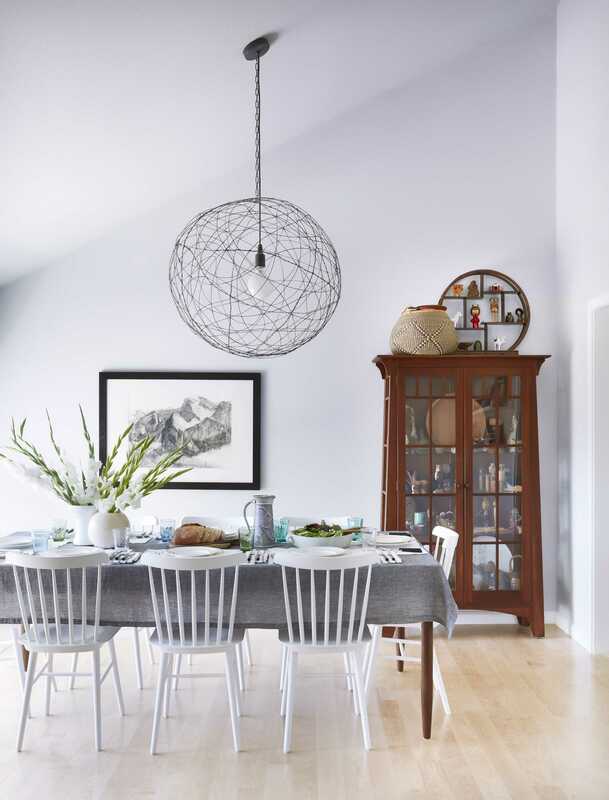 The Windsor chairs from Serena & Lily were a huge upgrade from the ones my parents had before, which were mismatched, half-broken, and wouldn’t push in (their arms were too tall). Why did my parents have chairs that were mismatched, half-broken, and wouldn’t push in? The answer is one of the reasons I love my parents the most; their huge aversion to waste. They don’t buy cheap stuff and when they buy something, they want to keep it forever. This has caused frustration for me at times. Like when they spent $5,000 on getting a sofa reupholstered instead of just letting me get them a new sofa that actually made sense in the space. But, for the most part, I think it’s a philosophy more of us could use. Buy once, buy well seems to have been replaced with buy what you can afford right now then throw it away and buy a new one when it breaks in eighteen months. So while my parents’ inability to get rid of stuff drives me crazy sometimes, I think my generation has a lot to learn from older generations about not being wasteful and gross. While I was at it, I figured I might as well source some new dishes and flatware for orMOMdo, so I snagged these beauties by Kate Spade (all the linens are from Parachute). 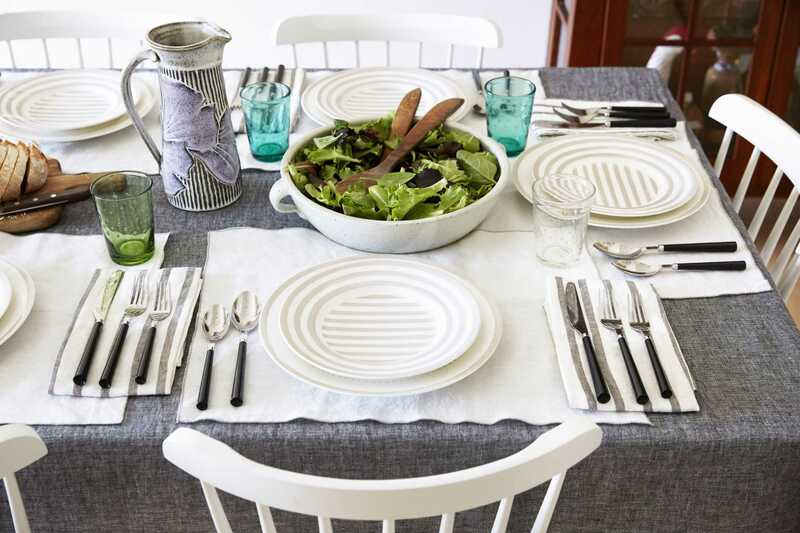 The dishes are distinctive enough to use for a dinner party but designed to be sturdy enough for everyday use, which is how my parents use them. 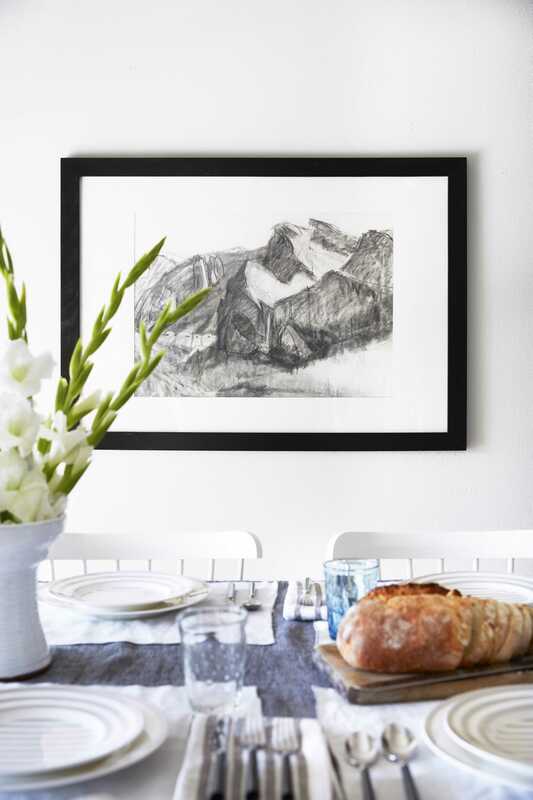 The beautiful charcoal drawing by Jane Culp was purchased by orMOMdo years ago, I think at an auction for an arts organization she was involved with called the Yosemite Renaissance. We had a lot of the same art in the house I grew up in and I always thought it was kind of stupid because we could look out the window and see it for real. But now that my parents aren’t in Yosemite anymore, I like the Yosemite art a lot more. It’s kind of like if you lived in New York and your walls were covered in New York street art, I’d think you were super one-note. I think it’s just more refreshing to have art that takes you away, rather than showing you exactly what is outside. I often get messages when I post pictures of table settings that I’ve done it wrong. There is a “correct” way of laying out knives, forks and spoons and I actually DO have it memorized at this point (mostly from getting called out so many times about it). But the day I shot this was pretty stressful and I forgot and did it backward (the spoons are supposed to be next to the knife). Here are my two cents on this: I DON’T CARE. Honestly, all flatware looks different, has different architecture, and the pieces interact differently with one another. 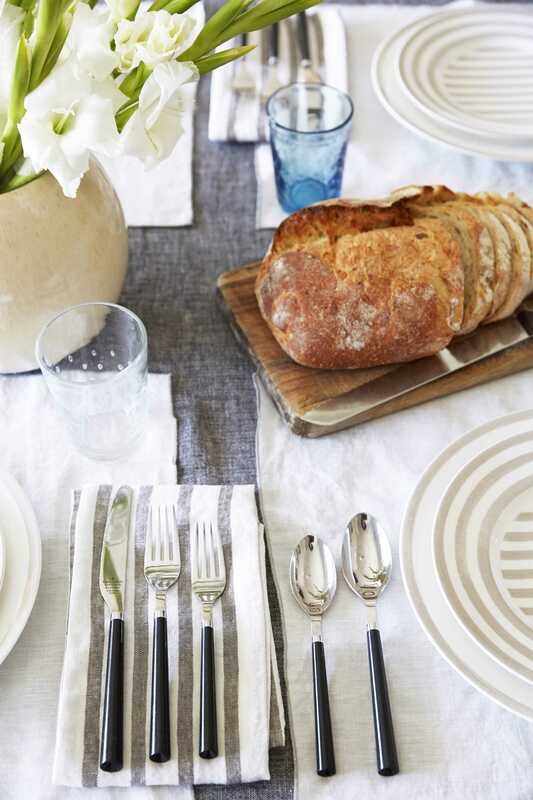 I tend to set the table the way I think looks the cutest for the style of flatware. I don’t really care that someone in France 500 years ago made some stupid rule about where your stupid fork was supposed to go. If your guest can’t find their dessert spoon because it’s not in the “correct” place, promptly ask them to LEAVE. 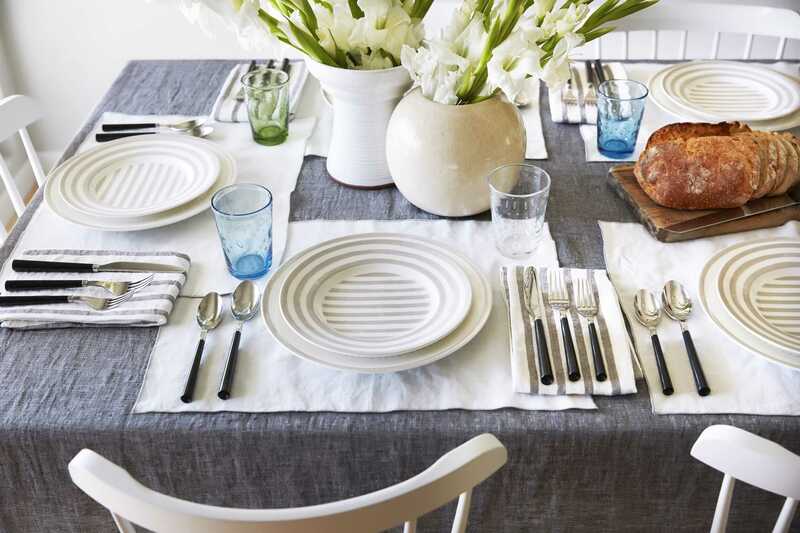 I love layering, so for me, a tablecloth with placemats on it is a dream. These rustic linens from Parachute make the setting feel warm and cozy. This classic American buffet was a huge bone of contention between my parents. orlanDAD really wanted it in the house while orMOMdo didn’t like it all. Full disclosure: I have to say that as a designer, I really don’t like this piece in the space, for a few reasons. Firstly, it’s very large and imposing. Second, the style introduces an element that feels a little out of place in the house (it feels more like it belongs in a farmhouse or a more rustic space). And thirdly, there’s already too much furniture in this room. There’s a credenza and a curio cabinet as well, so basically, every wall that doesn’t have a window has furniture on it. This made the previous dining table IMPOSSIBLE because it was so cramped you couldn’t get out of your chair. It was clear from being in there that my parents just took random furniture and crammed it into a room and being in there made me feel absolutely insane. BUT!!! There’s a huge caveat to my hatred for this piece. While I might think it’s terrible for the room and it still feels hulking and heavy, it tells a story about my family that I think is an important one. My parents inherited this from my paternal grandfather after he passed away. A reminder now that while I am a pasty white person, half my family is brown (my father’s family hails from Mexico). My Latino grandparents had a house filled with American antiques. I never thought twice about it until I started going to the flea market with Emily years ago, seeing so many Latino faces who deal in collecting and selling American antique furniture. I’ve thought a lot about this and wondered why my grandparents were so enamored with classic American furniture that they’d spend their free time roaming around estate sales and thrift shops looking for it. I think budget was probably part of it (my parents are both from large families that didn’t have a lot of money). But I think part of it was a pride and excitement about American culture. The Mexican side of my family always seemed more all-American to me than my Caucasian side did. While my mother’s family is a bit more offbeat and counter-culture, my dad’s side of the family was always more up-to-date on popular American culture, fascinated by it. I think that comes from my grandparents and I see their interest in American antiques to be part of an overall enthusiasm for and desire to be part of this country. This is kind of a random tangent but I feel like it’s a story that needs to be told. I don’t fully identify as being a brown person (or a white person for that matter) but what I know from my own family’s history is that Latinos (and other immigrants) are some of the most patriotic, hardworking people around and that classifying them as anything less could not be more off base or disgusting. To me this isn’t a political thing, it’s not about left or right, it’s just about treating other human beings with respect and conducting yourself with a certain amount of dignity. ANYWAY, REMEMBER WHEN I WAS WRITING A DINING ROOM REVEAL??? As we all know in the world of design, sometimes a piece of furniture is more than just a piece of furniture. So while this huge buffet cramps the table a little bit, it was important for orlanDAD that it be somewhere in the house so I made it work. The way I made it work was by relocating it to the space previously occupied by the curio cabinet. It’s now tucked into a little corner where it fits snugly and is also hidden from view if you’re in the sitting room. You kind of have to go into the room looking for it to see it now, which is how it should be. To make it feel a bit more on-brand with the rest of the room, I added a Tom Killion print and some accessories to make it feel a bit more considered. It’s probably not surprising that orMOMdo shares a love of blue with Emily and me. She’s been collecting blue dishes for years, so we installed some neat white shelves to display them. This display always makes me happy to look at. Although sometimes when I visit I notice she’s put something red in there that throws off the whole Zen vibe. At which point I take it down and hide it somewhere. I have been doing terrible, controlling things like this my whole life. So, there you have it! My entire autobiography and the biography of how I took my parents dining room from NASTY to RHINOPLASTY in a matter of minutes. It’s definitely a happier, more useable space now thanks to the furniture reconfiguration and the addition of the new table and chairs. It only took five years, but the dining room is finally usable! Intro Post: Casa Soria is Getting a Dining Room Update! I loved the part about your family – the patriotic feelings and excitement about America. So neat to hear. 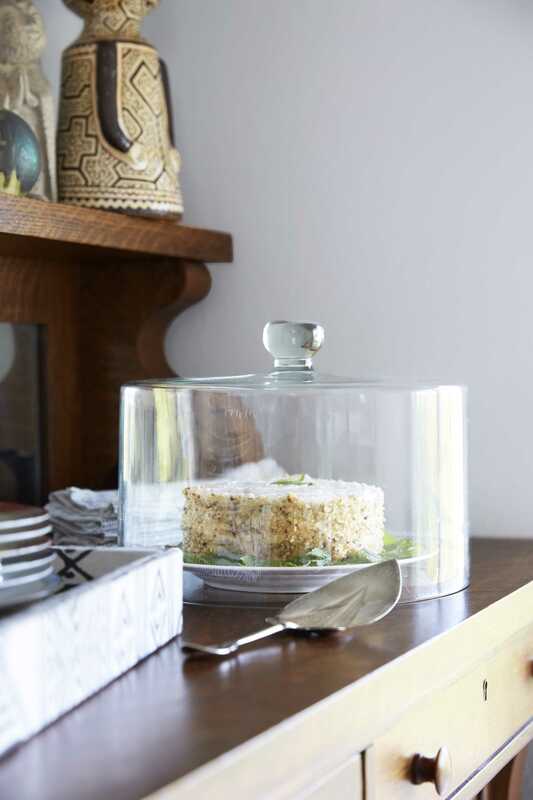 ❤Also I think the round display shelf on the curio is a really smart moment…it makes all the littles become one big item…and that’s an idea I woild have never thought of and will DEFINITELY incorporate! I like this home reveal because it’s not full of ALL new and OrMomdo has a great, unique taste so it’s a good blend and feels more real. Totally agree! I have been excited about Orlando’s reveals of his parents’ home because he so thoughtfully included so many pieces they already owned. This is beautiful (even if there really is a ton of furniture in here). That piece of pottery holding the salad is GORGEOUS!! I love when y’all explain the background of working with the furniture that exists in a home, it never fails to inspire me! I am so with you- I am obsessed with that salad bowl. Orlando, please tell us about it! agreed! scrolled down to see who makes it, I need it! Me too! and the pitcher! Happy to see Orlando’s work! I was going to say the same exact thing (i.e. I am French, I am shocked and the table is dressed wrongly, but great work 🙂 ) !! Plus, the reason for having the knife and fork on different sides of the plate is because you pick them up at the same time usually with different hands! 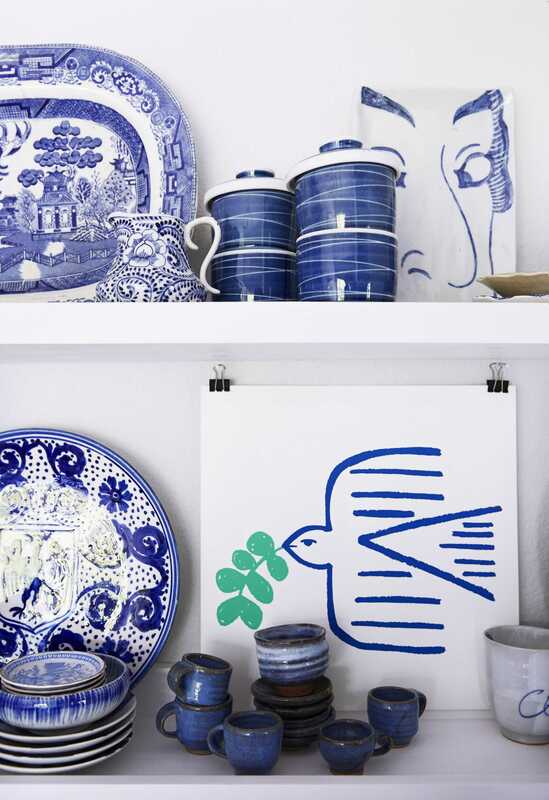 The white shelves mounted over pale blue wall presents a United Nations of ceramics. Who knew that would work? I love the blue and white collection. 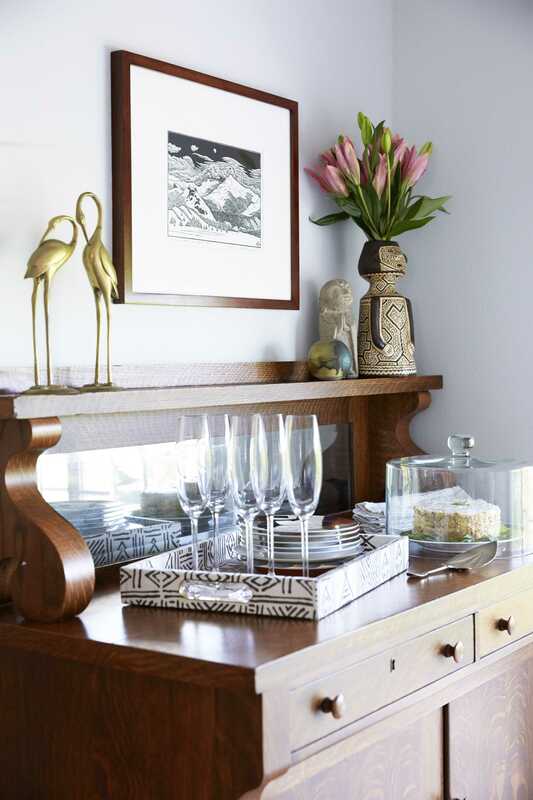 Bravo for the light and airy feel while displaying refined and rough together. I love this – thanks for walking us through how you thought about the changes. Families are beautiful, and spaces are about complementing families rather than vice versa. Thank you for the reminder! Love this room, it’s beautiful and real. I love reusing meaningful pieces and not just getting everything new from a big box. But I REALLY loved your observation about immigrants often being the most patriotic people in this country. As a daughter of immigrants, I’ve long held this belief and I think that it stems from the appreciation of being here, opposed to their home country where you don’t have the same freedoms and opportunities. Thank you for sharing! Really enjoyed this reveal and the writing both. I appreciate the talking through how to handle designing *not* from scratch and working with existing furniture and preferences. I liked the buffet but then saw what Orlando was talking about in terms of it belonging more in a farmhouse style–that’s probably why I like it as a standalone piece! I love, love, love Orlando. His posts always make me laugh a true, out-loud belly laugh, which is just the best feeling and we all need more of that, amiright?! Orlando you’re so funny and smart; I’d read anything you write. Nice job on the space too – what lucky parents you have. I really appreciated this, especially the reuse of furniture that a designer might find less than perfect but that needs to stay in the room. The room looks more interesting as a result. Perfectly designed rooms are boring, especially since they all seem to look a like these days. I love this all so much! The design, the writing, the phrase “NASTY to RHINOPLASTY”. Orlando, come style my home and be my friend. You are uniquely awesome. 1. the first thing that made me fall in love: “about not being wasteful and gross.” – that is literally the perfect description for the wastefulness i see in our society’s way of living, and i call this gross all the time, so it totally jumped out at me. 2. the second thing that made me fall in love: the tangent about immigrants and patriotic-ness was so nice to read. i feel like we’re living in a time of more and more disrespect of immigrants (whether it’s legal or “illegal”) and it’s so disheartening (or “disgusting”, per orlando), and hearing/reading this perspective is very much needed. we are all human beings, people! and we are literally all immigrants (unless you’re native american). let’s all try to keep this in mind. 3. the third thing that made me fall in love: this really applies to several of orlando’s posts about his parents’ house. i love that we’re seeing how he is incorporating his parents’ existing furniture (and respecting its history and reason for being there) into a redesign. i think this is important because IRL, we all have furniture that is not trendy or the latest style, but that we are not going to just get rid of because we have it for a reason/it has a family history/story. so, its way more relatable to see this kind of redesign vs. getting everything new. 4. the reason i’m always in love with orlando’s posts: he’s hilarious. 🙂 Oh, and this redesign is just gorgeous! YES! Those tea cups stacked on the cake stand-so lovely!! I love this reveal! I would love to see more makeovers/reveals of homeowners in this age bracket as they downsize/streamline their homes and want to incorporate a lifetime of collections/furniture/STUFF in t heir new home in a fresh way. I have that exact curio! It’s from Ethan Allen. I’ve been on the fence about whether to keep it, but if it’s good enough for Orlando, it’s good enough for me. Love that this is a beautiful, not overly styled space that looks like it truly incorporates memories and things are important to your family. The story of your family is the best part. I would kill for that buffet–I can’t believe it was an issue at all in the room! I love it so much. It’s got a million times more beauty and personality than that white credenza, for sure. The room looks amazing and a huge shout out to Orlando’s mom’s collections. So unique and interesting! I would walk in this house and want to talk about every piece. Really cool stuff, and Orlando did a great job integrating it into the design of the home. I had the same “OH look at that” moment when I saw that antique buffet. I completely understand that maybe the scale is off for the room when you’re looking at it in person, but man my breath actually caught in my chest when I saw it. AGREEE! if too much furniture let go of the white one…the buffet is beautiful…and i am not an ‘antique collector.” great job making it THEIR space! Absolutely! Quartersawn oak is so gorgeous, and you can’t find that quality in new pieces hardly at all anymore. I agree, that buffet is my favorite piece in the whole room and the way it’s styled makes it feel very functional for the space. It definitely has real soul! Also I always crack up when reading the comments on Orlando’s posts because according to the readers of this blog, HE CAN DO NO WRONG!!! In the age of the internet it’s so rare to see people not being the PC police or saying mean things in the comments. That never happens with Orlando, even when he spices up a home makeover post with topics that are a tad more controversial/personal. I love the comment about moms always putting a random object that throws off the whole vibe, I take those down and hide them too. Every time I come over my mom’s shelves get a small makeover! The amount of collected and passed down cultural items that your parents own makes me so envious though, our family immigrated here in like 2004 so we have nothing but new stuff. Well, other than what I’ve collected myself over the past few years, but things that have been in your family for generations are much more special! Such a great post! Thanks for sharing about yourself, and thanks for not sacrificing family history on the alter of design. You have my respect and gratitude. great transformation, love it all the more because of working with existing pieces and showing off family history! would love to hear more stories about Orlando’s childhood in Yosemite, btw! Love this post (and the tangents!) Please – do more posts on not designing from scratch! We all have furniture that someone in the family can’t part with – but the rest of us can’t stand. Or we can’t afford to start fresh. Or we feel bad about throwing out/giving away half-decent stuff we spent money on. It’s so helpful to see how you dealt with that/made it work. Man, I love this. Especially the part not being “wasteful and gross”. I always think homes that have lots of older, storied pieces FEEL so much better than a “perfectly” designed space. I’m sure that’s something that’s really hard to capture in pictures. But this dining room looks like a place I’d actually like to hang out, not just stare at. Orlando, I love your approach to design and writing! Like everyone else here, I love Orlando’s writing style, his humor, values, and love for his family. But what I especially love about the posts he does about his parents house is that it is much closer to what most of us experience when we decorate our homes. Whether for sentimental reasons, differing opinions/styles, or financial reasons, we can’t replace everything. A home like this is so much more interesting and requires so much more talent than most of the stuff on design blogs these days. I love that buffet, and love the story you shared around keeping it. Personally I think it’s gorgeous and in such good shape! What a treasure to have and share with your family. This was such a treat to read, Orlando. You are a hilarious writer! 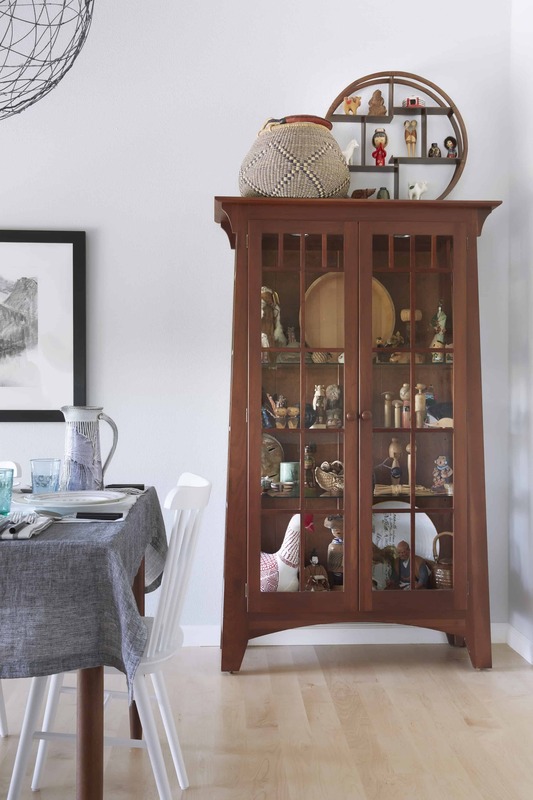 The reason this post felt like a breath of fresh air is because you kept pieces that your parents have collected and it still feels like a **home**. Scrapping every piece of furniture in the name of an internet makeover (while fun) ends up feeling a little cold in the end. The stories behind the pieces you kept make this house a true home and I think that’s what I identify with. Thank you for listening to your parents and keeping their things. As a lover and keeper of “stuff” I appreciate this so much!! Love this! What a gorgeous space with a melding of old and new. Also really enjoyed hearing about Orlando’s family and all of the sentimental attachments. Thanks so much for sharing! Orlando! Here’s a tip that my very sweet Grandma taught me when I was a kid that will help you remember the correct order for flatware: Set them out alphabetically–fork, knife and spoon (f, k, and s). Don’t know if you read comments, but on the top right side of the white shelf there is a plate and an outline of a pitcher in front of the plate , what is this ? Something you drew into the photo? Or am I not seeing what it is ? Thanks anyone who can answer . LOVE it all!! Thanks Orlando! Really enjoyed hearing about Orlando’s family and I love the idea of the basket in the dining room to hold dirty towels, etc. This may be the solution I’ve been looking for!!! I love this post a LOT LOT LOT – the style, your voice, and your thoughts. SO jealous of all the white and blue ceramics and plates. 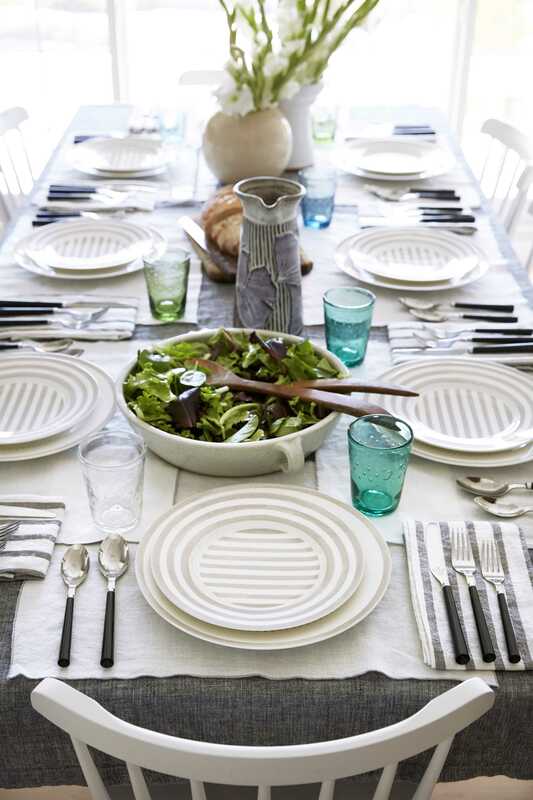 I really love that tablecloth and will try to save up for it! So well done, bravo! What a great post! Just like the beautiful design of this room, which combines several styles in a great way, your writing effortlessly combines discussion of “cuteness” with important commentary about our culture and society. Wow, it looks incredible. I love the buffet and think you worked it in perfectly. I actually love the buffet. The shape, the age of the wood. 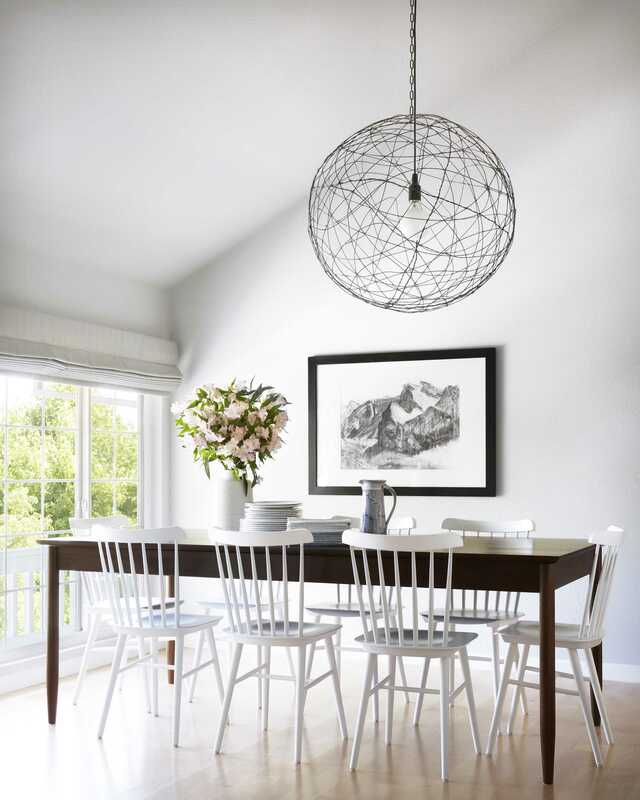 It’s a nice juxtaposition with the lightness and angles of the table and chairs. Such a pretty room. And sneak peak into the kitchen!! Woot woot! Can’t WAIT to see that. Love that you used old and new. Need more posts (from you)like this. This is real life! Orlando, you gave a beautiful gift of yourself to your parents. Great attention to design detail while respecting what is important to them. Thank you and Emily for including us on the journey. That person-shaped vase. I want it. Now. Is it a Japanese objét from your mom? 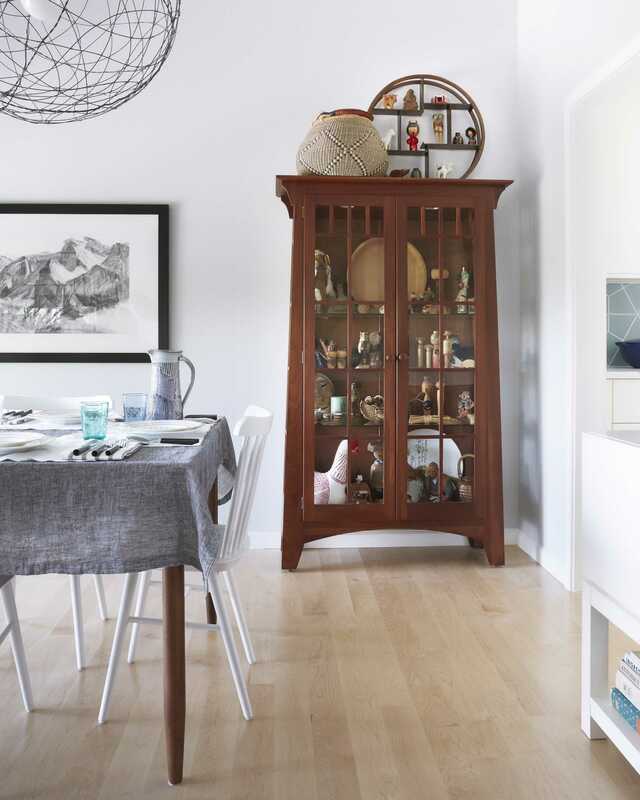 Personally, I like both the curio cabinet and the buffet in the room…keeps all that white from floating away. And there’s something about white painted furniture that reminds me of cheap particle board with plastic white laminate. It’s a nightmare from MY childhood that I’m trying to forget. Also, the legs on those chairs are going to be sooooo scuffed and dinged. I think I might have left the legs unpainted …. although if you got them from Serena & Lily, I’m sure they came painted all over. Otherwise, a real home run! I love the entire post, Orlando. Your voice comes through so clearly, both in the hilarious parts and in the more serious explanations. I just love that you say “I don’t care!” about the silverware placement, even though I DO care, just a little bit, about things like that. And I love that you bring all the stories of your family into the room and into the writing. Orlando – where I can I buy the bowl with the salad in it? It’s perfect. Orlando is the freaking best. His rooms always feel fresh but they’re never just a regurgitation of the hot new thing. So inspiring to see old and new furniture come together for a totally unique look that feels simultaneously current and timeless. I have loved following along with the Casa Soria project. Whenever Orlando posts, I get soooooo excited!! I love his personality, of course, but also his aesthetic and the way he walked us through keeping existing things in a new space. Orlando is a Delight! I agree with all the positive comments about what a wonderful post this is. Also want to add that every time I see Orlando’s design work I think he is a genius at finding quality, exciting art. “Buy once, buy well” is a good philosophy to design by, and what I’ve been working towards. The only problem is that what you buy has to be incredibly versatile if you want to keep it for the next 30 years! 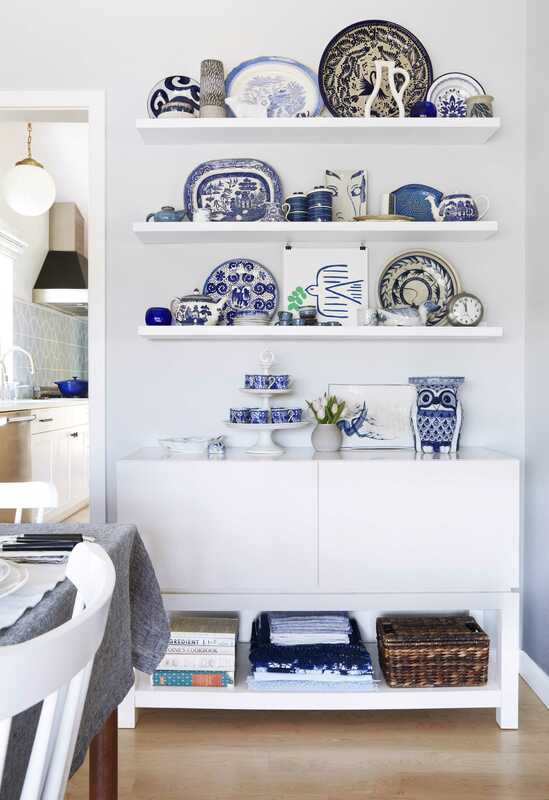 The dining room looks great, and I love love love the blue dishes display! I love literally everything about this! This post / room is so full of heart and warmth. Would your parents ever let you paint the a-line curio cabinet? It would look great – black, navy, gray or even white. Thank you for your paragraph about the immigrant experience. I come to this blog a lot to think about things other than the news, and the way you did it was very uplifting. You could have easily deleted that paragraph and you didn’t and if more people in the public eye start to do things like this, we could subtly, slightly shift the world. Thank you thank you thank you. Also, I’ve shared these posts with my mom who brought all of her furniture from her big house to her retirement condo and I’m encouraging her to edit a bit. I send her these posts and show her look what Orlando did to OrMomDo. She loves you too. Gorgeous final result and hilarious writing, as always, from you Orlando! I lthink the antique American buffet is bee-you-tee-ful, myself, and think it adds a great personal touch — and the story behind it is even better! 1) Orlando. SRSLY. place settings!! I’m not French, but this makes me twitch each time I look at those pictures! 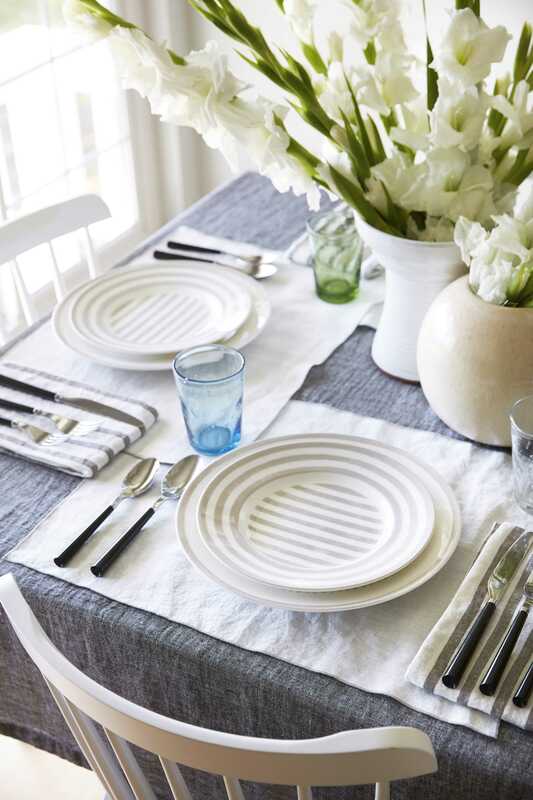 2) LOVE, LOVE, LOVE that you incorporated family pieces. This IS how most of us decorate, for many reasons, so it’s so refreshing to see a true designed make it work (gorgeously)! 3) LOVE, LOVE, LOVE your aside on immigrants and their patriotism and appreciation for our country. In my experience, that’s certainly true. 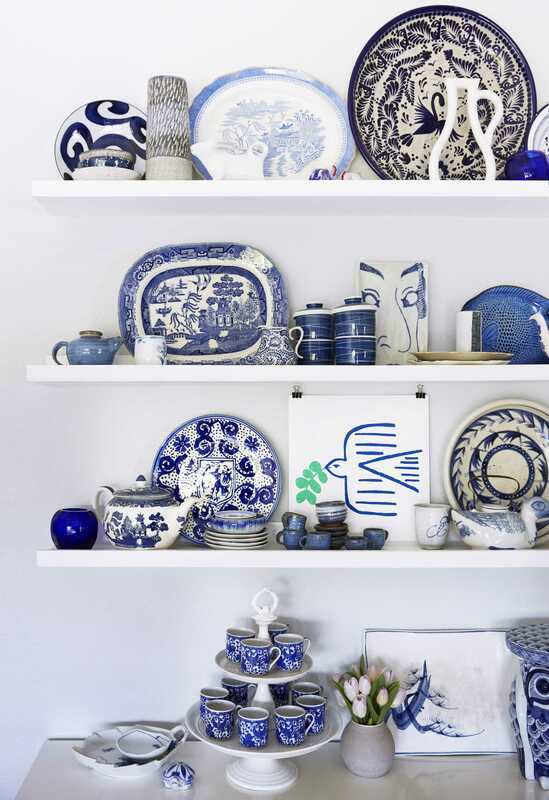 That first photo of the shelves for the blue ceramics literally took my breath away. It’s STUNNING and makes me want to immediately begin collecting blue dishes. EHD: Make sure to tell Orlando to print out these comments and when he is feeling blue (which I know he does from watching his Instastories) he needs to take them out of his night table and READ them all! He is so funny and talented. OrMomdo must be so proud! It looks great, I loved learning more about your family and identity (GLAD that it’s not just a reveal- that’s one of the reasons why I read this website more than any other design blog), + I LOLed about the controlling hiding of plates that mess with the vibe. Well done! The blue porcelain collection is so amazing!! Wow! Thank you for sharing the stunning room decoration! I agree! Can’t find your soup spoon? No soup for you! Love the room -thanks for keeping the hulk it’s important for us to remember our forefathers and foremothers (?) Love your attitude you crack me up ! Faithfully, OrFANdo.